In the sweep to purge my household of unnecessary, unwanted, unknown or forgotten items and store That Which Must Be Kept For Now efficiently and accessibly, I plunged through a box of letters and a bag of notebooks this afternoon. I may save the letters for another time (they included my mournful letters to my high school boyfriend during the summer between our junior and senior years when he was working at a camp in the Adirondacks while I stayed home in Virginia). The notebooks were mostly dismiss-able, excepting the one I kept in graduate school while studying and writing poetry with the still-marvelous poet, Peter Klappert. (He’s still teaching at George Mason University and his collections of poetry are on Amazon.) I began flipping through it with curiosity and eventually had to sit down and really read. My own poems in this notebook interested me considerably less than re-examining the exercises and assignments he gave us (along with examples). As I sorted through the villanelles, list and catalogue poems, epigrams, and adaptations among others, and reviewed his instructions, I realized anew what a fine teacher I had in him and what a trove of instructions I have stumbled back upon lo these many years later. It occurred to me that it might be an interesting new exercise to give myself the course all over again — well, to follow Peter’s decades-old instructions — and see what comes of it NOW. 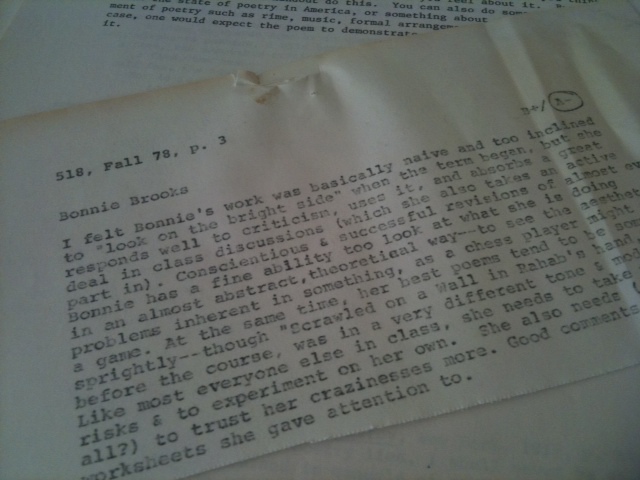 In his final feedback of my work (I got an A- in the course, it says so on his note), a long and insightful (and not entirely complimentary, he didn’t like the “naivete and sprightliness” of most of my poems) paragraph, he noted at one point, “Conscientious & successful revisions of almost everything…a fine ability to look at what she is doing in an almost abstract, theoretical way – to see the aesthetic problems inherent in something, as a chess player might view a game.” He encouraged trusting my craziness more, to take wilder risks and experiment on my own. It’s not bad advice for any artist.